Multipurpose Church building and foundation for new Refugee housing facility. Because of a complaint by a Yezedi Parliament Member concerning the “Destruction” of her culture by Christian evangelism, we are no longer allowed to minister in the Refugee camps. Our humanitarian aid is still welcomed but not our beliefs. This is a set back, nothing more. The refugees we’ve touched live in the camp and share their new found faith with their neighbors. We now simply bus them too our meetings outside the camps. The war with ISIS has severely impacted the economy of Kurdistan, as pastor Layth put it, The money on the streets and in business has dried up. Many of the wealthy and prosperous have fled the country, business has come to a standstill. And no wonder with the ineffectiveness of the Iraqi army and allied air strikes against the ISIS forces. Now comes Russia adding its air power to the mix for Syria’s advantage. The only effective fighting force on the ground are the Kurds who are still under equipped and ill-supplied by our government to defeat ISIS. This has created an atmosphere of uncertainty and fear concerning the future. With Europe opening its doors to receive more refugees hoping to relieve the pressure of the massive numbers now overwhelming the camps, this has sent a go signal throughout the region. A kind of “Get out while you can!” message. Even Kurdistan has quit issuing passports to those in the Peshmerga because some of them have used them to leave the country. I suspect that this is because many fear that, once more, America is just going to bail out and leave them to hold the bag. What about those who can’t get out? This is a question Pastor Layth Ibrahim posed to me. Somebody’s got to help them get through this mess and find their future. Pastor Layth and his family could leave but he won’t. He understands the times and the opportunity for the Gospel. He also loves his people and they certainly love him. While others run and abandon what they’ve built, Pastor Layth continues to build, trusting GOD and HIS purpose in the region. It’s obvious that he can’t do this without us. What I’m about to say isn’t meant to insinuate guilt and play off it. We’ve come so far over the last ten years and have overcome challenge after challenge. We’ve fought every step of the way to gain the ground we’ve taken. Now, TEN YEARS AFTER, we’ve finally gotten the spiritual breakthrough we’ve sought … but it’s taken this crisis to break the ancient traditions so deeply rooted in the cultures of the region. If we quit now and follow the current worldview of the hopelessness of the situation, we’ll lose all we’ve worked so hard to gain. We have to be the ones who believe we can win this war. Strange as it may seem to many, I believe that if we can win the spiritual battle in the region, the material battle will also resolve in our favor. We not only have a man to stand in the gap, we have a team, a church and we’re laboring for the common good with an alliance of other churches we’ve helped and continue to labor with. It’s the crisis that’s turned things for us, how foolish we’d be not to exercise the faith to see it through. Under the current situation it’s imperative that we have our own facility to work from. We can’t be subject to the whims of others who bail out on us or won’t give us access because of pressure or controversy. We are a legal Church in Kurdistan but we’re expected to confine our activities to our own facilities. It’s for this very reason we’ve built our church as a large multi-purpose facility. We’re still $40,000 from completion to the point we can open the building and we need to open up quickly. Take look at where we’re at. You’ll see two buildings. Our church facility and the foundation for another new building built specifically to house refugee families. This second building was sponsored by another NGO that also works with pastor Layth. Their burden is to provide refugee housing. The building is administered by and belongs to the church after fulfilling its designated purpose. The beautiful thing is, this will provide housing for many of the new refugee families that have come to Christ. 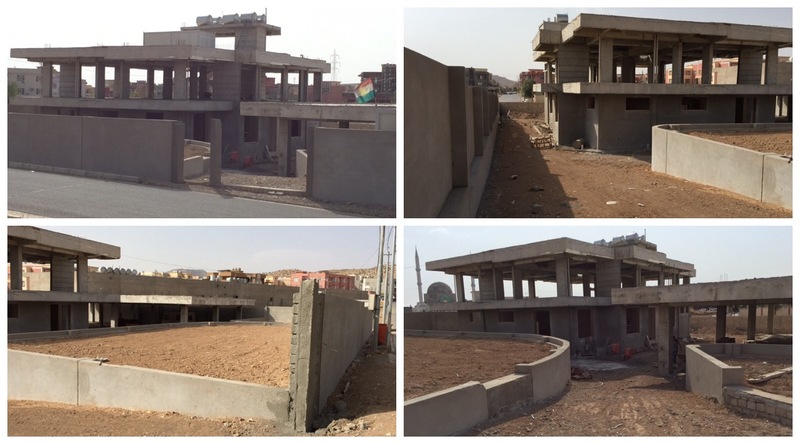 Pastor Layth has literally developed a Christian community right in the heart of Duhok on our church land. Help us get this work finished and opened.